Choosing the vitamin C supplements that fits your needs can be challenging considering the vitamin is available in several different forms and a range of dosages. Sodium ascorbate is one type of supplemental vitamin C you'll find on the shelf. If you can't tolerate the natural acidity of vitamin C, sodium ascorbate may be a good choice. Just be aware that it contains enough sodium that it may not be suitable if you must limit your sodium intake. Sodium ascorbate consists of a combination of sodium and vitamin C, or ascorbic acid. In this mixture, sodium serves as a buffer, creating a less acidic supplement than those made entirely from ascorbic acid. This means it may be easier to tolerate if your digestive system is sensitive to acid. Your body absorbs and uses sodium ascorbate just as well as natural vitamin C, according to a review published in the October 2013 issue of "Nutrients." Like other vitamin C supplements, sodium ascorbate is most effective for preventing or treating a deficiency of vitamin C. While it's best to get all your vitamin C from fruits and vegetables, taking a supplement can ensure you meet your daily requirement. Consuming the right amount of vitamin C ensures you'll benefit from its antioxidant protection. You also need it to produce collagen, heal wounds and keep your immune system healthy. If you take sodium ascorbate regularly, it may shorten the duration and severity of a cold, reports a review published in the "Cochrane Database of Systematic Reviews" in January 2013. At large doses your body begins to absorb less vitamin C, so you'll get the most benefit from your supplement by taking it in smaller doses more frequently. Some studies suggest taking 250 to 500 milligrams twice daily with meals, reports the University of Maryland Medical Center. To determine how much you need, track your intake to see if your diet provides the required amount. For women, that means getting 75 milligrams daily, while men need 90 milligrams. If you smoke, you should consume 35 milligrams more than the RDA each day. Don't exceed the safe upper intake amount -- 2,000 milligrams daily -- without consulting your health care provider. About 11 percent of the sodium ascorbate mixture consists of sodium, so if you take 1,000 milligrams of sodium ascorbate, you'll get 111 milligrams of sodium. The amount of sodium in the recommended dose should be listed in the supplement facts. If you have high blood pressure or need to follow a low-sodium diet for any health reason, you may need to limit your intake of sodium ascorbate supplements. Nutrients: Synthetic or Food-Derived Vitamin C -- Are They Equally Bioavailable? 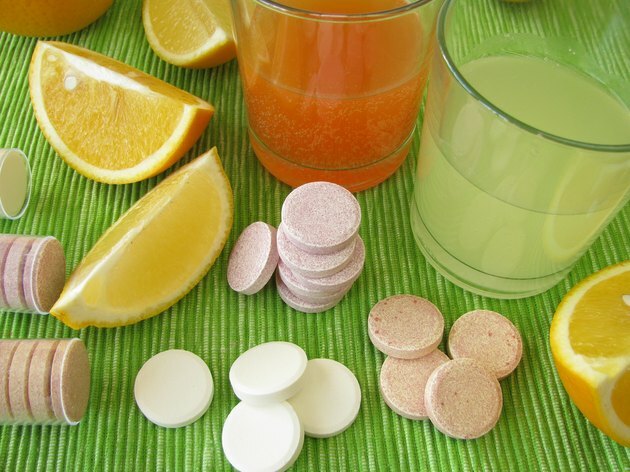 Should I Take Vitamin C in Powder or Pill Form?